Just-Dice.com, launched in June 2013, is a CLAM dice site that players can wager CLAM on for rolls of virtual numbers. Set up like most other cryptocurrency dice sites, Just-Dice offers players the ability to not only play and wager, but also invest in the site and earn a percentage of the house edge, depending on how much they invest. Heralded as one of the more premier cryptocurrency-style of dice sites, Just-Dice has been around for nearly two years and has continued to provide the cryptocurrency community a place that is both trusted and has maintained a level of superior gameplay during its time online. Just-Dice is exactly what its name entails, it is a crypto-currency site that only features a dice game for players to wager on and nothing else. The slight twist behind this site, though, is the fact they do not accept the normal type of cryptocurrency such as Bitcoin, Litecoin, Dogecoin, or any other specific coin that most other online cryptocurrency casinos use. They only accept CLAM as both a form of deposit and withdrawal as the method of funding. For those players not familiar with what CLAM are, the CLAM project was launched back in May of 2014. Every Bitcoin, Litecoin, and Dogecoin address that had a non-dust balance in early May was given 4.6 CLAMs for free, and that is how all the CLAMs were initially distributed. If a player has a BTC, LTC, or DOGE wallet that was funded in May 2014 or sooner, they already have some CLAM. CLAM can also be exchanged through online exchanges and can be purchased as well. As far as actual gameplay is concerned, it is setup in a fashion that most other style of dice sites are set up in. Players have the opportunity to wager on specific items or categories depending on the preference that they choose. These include the percentage of chance they have of winning, the number (either higher or lower than x) that they would like to wager on, or the multiplied payout they are trying to win, such as 2x, 3x, etc. As players wager, they will see a real-time full-site statistical ticker that is running and shows the amount the site has currently taken in. It will also show real-time personal statistics of each player below the site statistics. Just-Dice also offers a unique option within their gameplay for players wanting to participate in investing within the site, to build the bankroll and increase the maximum bet the rest of the players wagering at the time can wager up to. Just-Dice is one of the few cryptocurrency dice sites that not only allow investing, but also increases a max a player can bet up to, in real-time. 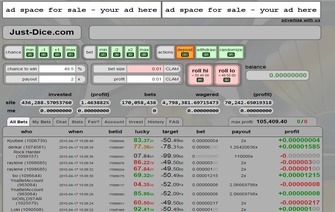 Players that invest in the site can also see in real-time how much their investment in making each roll of the dice, something that is unique to the Just-Dice website. As mentioned above, Just-Dice is a bit different than what other cryptocurrency casinos and gaming sites offer, in the case of the cryptocurrency they accept. Just-Dice only offers the ability to deposit and withdrawal in CLAM, as were explained above, but work just like any other cryptocurrency would, in regards to the process of transacting. Each deposit takes ten confirmations to be credited, but unlike Bitcoin, CLAM operate in a faster transaction time than that of Bitcoin, so each deposit takes around ten minutes to be credited. The withdrawal feature takes a bit more time and is one of the downsides of using CLAM and Just-Dice. The number required is the number of digits in the integer part of the number you get when you square the amount you are withdrawing. So a 31 CLAM withdrawal needs 3 confirmations (31 * 31 = 961) and a 32 CLAM withdrawal needs 4 confirmations (32 * 32 = 1024). Although, it does take longer than a cryptocurrency like Bitcoin, it will still be received in the account, but may take some time depending on how much the withdrawal request is for. Support at Just-Dice is relatively quick when it comes to overall site questions or inquiries, as most players within the chat are very supportive and can usually help solve other players issues. For administrative inquiries, most of the time the chat has at least one of the administrators in it, just in case a player has a more complicated matter to resolve. If by chance one of the administrators is not in the chat room, a support email can be sent to the email provided at the site. Response time is very quick through each method, but most times the support can be found through the help of other players that use the chat. Just-Dice uses the “provably fair” verification for each roll of the dice to ensure both site and player have the ability to confirm the outcome of each roll. Just-Dice was launched in June 2013 as a Bitcoin dice site, but has transitioned over to a CLAM dice site, but still functions as well it did when it started. As far as the site is concerned, it maintains a smooth gameplay, good support, and an overall openness to both players and investors in the site. The only downside to the Just-Dice brand is the transition they made in 2014 to CLAM. Most Bitcoin players who play online, have very little information about CLAM, but it works in the same way as any other cryptocurrency. Although deposits are fast, the major negative to Just-Dice is the time it takes to receive a withdrawal. That being said, Just-Dice is still a good place to play for players who want trust, know what CLAM is, and are willing to have a payout delayed compared to what they normally would expect anywhere else.